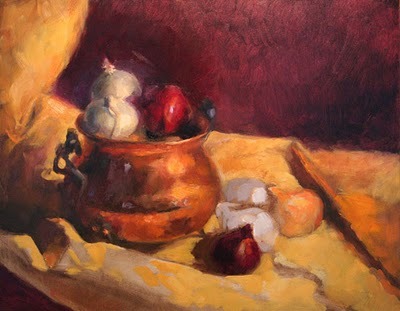 This is a painting I am working on in Juliette Aristides' still life workshop in Seattle right now. As a class we started our paintings by doing a drawing and then transferring it to the canvas with transfer paper. Then we inked the drawing by tracing over the major lines with indelible sepia pen. Over the inked drawing, we did a raw umber underpainting called a "wipe out" (wiping away the brown paint with a cloth, down to the white canvas, to do a full tonal underpainting). Only then did we start with color, working from dark to light, concentrating on one area of the picture at a time. Juliette teaches us to paint with small "tiles" of paint laid next to each other, each tile a short little brush stroke. She says I need to work on making tiles that are closer in tone and value, more sensitive and subtle. She demonstrated it for me in the white onions at the top, which is why those onions look so good! We work on longer paintings like this one on the afternoons. In the mornings we do small exercises, like value scales and black and white poster studies and color wheel mixing. Now that I have my laptop I'll photograph some of those next week and post them. Sadie your painting is so beautiful I love those rich colors. I enjoyed reading about the painting process that you are learning. What a treat to be studying with Juliette. Thanks for posting your progress. Yes, thank you for posting your work, your travel stories and letting us see the work done in the ateliers -- I always look forward to reading your blog as well as viewing the photos.